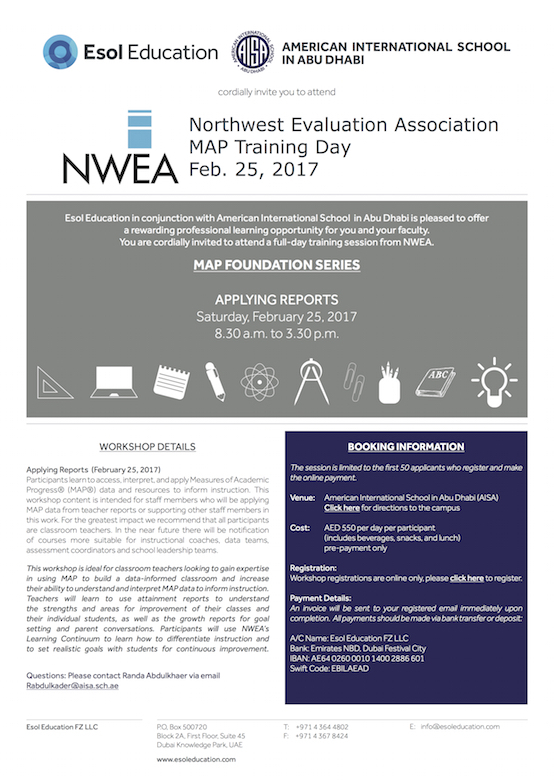 Esol Education in conjunction with American International School in Abu Dhabi is pleased to offer rewarding professional development opportunities for Abu Dhabi-based schools with one-day Measures of Academic Progress (MAP) Foundation Series program led by the Northwest Evaluation Association (NWEA). This session is limited to the first 50 applicants who register and make the online payment. Payments: An invoice will be sent to your registered email immediately upon registration completion. Measure of Academic Progress (MAP) is a computerized assessment in reading, language and mathematics reported in RIT (Rasch Unit) scores. This test is adaptive, i.e. the difficulty level of a question depends on a student’s answers to the previous question, which helps evaluate students’ progress and their development and understanding of basic skills. It pinpoints a student’s strengths and weaknesses and helps the instructors develop better learning strategies and improve their teaching. This assessment shows the results and progress of the students at one given period of time and does not evaluate overall intelligence or learning abilities of students. RIT scores help establish a student’s level and show their academic progress in charts and numbers from year to year. RIT scores range from about 140 to 300 with lower scores for lower grades. The growth guideline chart demonstrates the median RIT scores across the district or nation and helps determine if a student performs at, above, or below the grade level of all the students of the given nation or district. 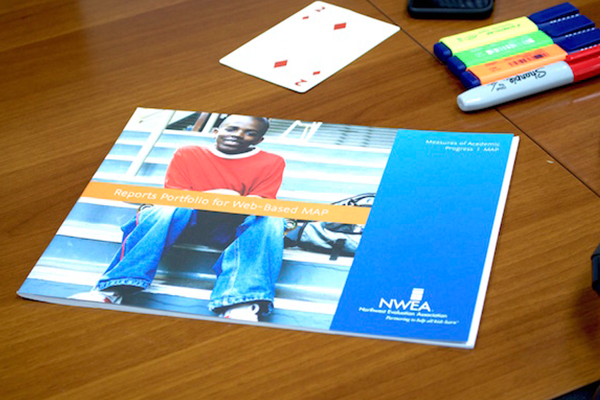 The results of MAP testing are considered alongside with other assessments and classroom performance when making decisions about students. 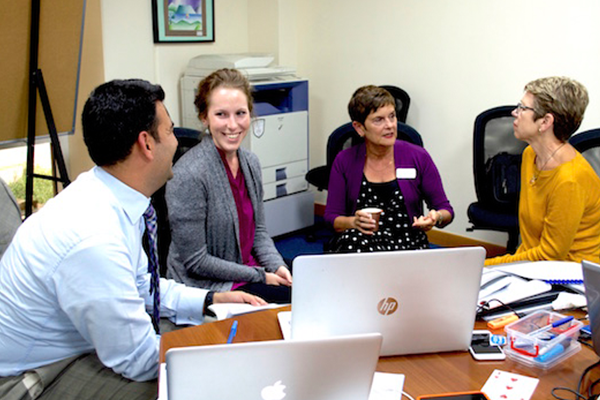 According to the 2016-2017 School Inspection Supplement released by KHDA’s Dubai Schools Inspection Bureau (DSIB), all American schools following a US curriculum are required to provide the NWEA MAP tests for Grades 4-9. The MAP test is also part of the recommended list of tests for schools following the IB, UK, Indian, Pakistani, Philippines and Canadian curricula.